Employee participation and voice (EPV) concern power and influence. Traditionally, EPV has encompassed worker attempts to wrest control from employers through radical societal transformation or to share control through collective regulation by trade unions. This book offers a controversial alternative arguing that, in recent years, participation has shifted direction. In Employee Voice and Participation, the author contends that participation has moved away from employee attempts to secure autonomy and influence over organisational affairs, to one in which management ideas and initiatives have taken centre stage. This shift has been bolstered in the UK and USA by economic policies that treat regulation as an obstacle to competitive performance. 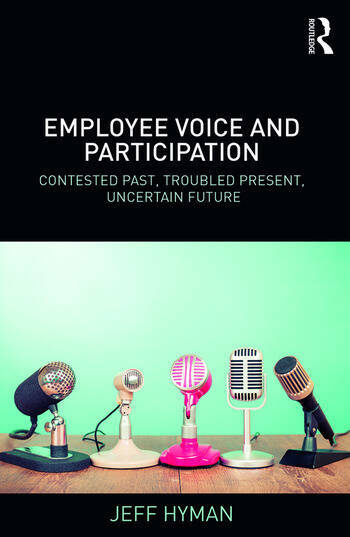 Through an examination of the development of ideas and practice surrounding employee voice and participation, this volume tracks the story from the earliest attempts at securing worker control, through to the rise of trade unions, and today’s managerial efforts to contain union influence. It also explores the negative consequences of these changes and, though the outlook is pessimistic, considers possible approaches to address the growing power imbalance between employers and workers. Employee Voice and Participation will be an excellent supplementary text for advanced students of employment relations and Human Resource Management (HRM). It will also be a valuable read for researchers, policy makers, trade unions and HRM professionals. Jeff Hyman is Professor Emeritus in Employment Relations at the University of Aberdeen, UK, and Honorary Professor of Management at the University of St Andrews, UK. His long-standing research and teaching interests are in employee participation and the future of work.